Each month we host a Graphic Novel Book Club meeting, open to all, during which we hang out and informally discuss a featured graphic novel. 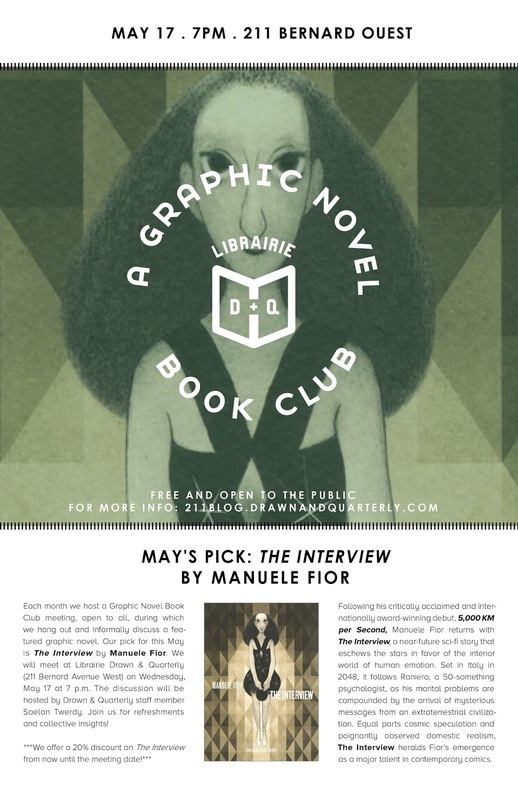 Our pick for this April is The Interview by Manuele Fior. We will meet at Librairie Drawn & Quarterly (211 Bernard Avenue West) on Wednesday, May 17th at 7 p.m. The discussion will be hosted by Librairie Drawn & Quarterly staff member Saelan Twerdy. Join us for refreshments and collective insights! Following his critically acclaimed and internationally award-winning debut, 5,000 KM per Second, Manuele Fior returns with The Interview, a near-future sci-fi story that eschews the stars in favor of the interior world of human emotion. Set in Italy in 2048, it follows Raniero, a 50-something psychologist, as his marital problems are compounded by the arrival of mysterious messages from an extraterrestrial civilization. Equal parts cosmic speculation and poignantly observed domestic realism, The Interview heralds Fior's emergence as a major talent in contemporary comics.